The global 2-shot injection molding market exhibits a high degree of fragmentation, with a large number of players in the marketplace. This also accounts for the market to be highly competitive, observes a market study by Transparency Market Research. Some of the key players in the global 2-shot injection molding market are Paragon Rapid Technologies Limited, Nyloncraft Inc., Rogan Corporation, and Gemini Group Inc. “Top players in the market are focused on minimizing lead time and increase production volume to stay competitive in the market,” says the lead author of the study. The global 2-shot injection molding market was worth US$6.6 bn in 2015 and is expected to be worth US$11.5 bn, rising at a CAGR of 6.5% between 2016 and 2024. 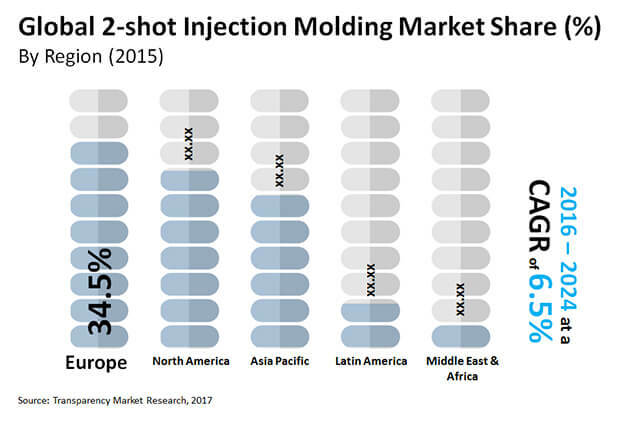 On the basis of geography, the global 2-shot injection molding market is divided into North America, Asia Pacific, Europe, Latin America, and the Middle East and Africa. Amongst these, Europe is anticipated to display unsurpassable lead in the global market over the forecast period. Despite a minor decline, the region is expected to hold a share of 33.9% until the end of the forecast period in 2024. The increasing use of 2-shot injection molding solutions to reduce production cost and labor cost are the reasons that have kept Europe in the lead. In terms of application, the market is segmented into medical, electrical and electronics, automotive, consumer goods, packaging, and industrial. Amongst these, medical stood as the leading application segment in 2015 and is estimated to hold a share of 25.8% in the global market by 2024. The growing geriatric population pool along with the advancement of the medical industry are positively influencing the growth of 2-shot injection molding market. Automotive held a key share of nearly 20% of the overall market in 2015. The demand for 2-shot injection molding systems for automotive is expected to be on the rise in the coming years. Air vents, lock casings, mirror systems, keypads, key shells, interior and exterior trim are some of the automotive components that use 2-shot injection molding for manufacturing. The use of 2-shot injection molding guarantees the production of precise parts along with accurate repeatability using one single tool. Due to this, OEMs are increasingly using 2-shot injection molding process for the design and development of products. The use of 2-shot injection molding solutions also is also economical in terms of cost, as two or more components can be produced in a single operation, thereby boosting the market’s growth. The increasing pressure from governments for recycling plastics is also driving the 2-shot injection molding market. This is because governmental stipulations are mandating industries to recycle materials because of which OEMs are increasingly adopting 2-shot injection molding solutions. 2-shot injection molding process has the advantage that any two core components can be obtained using recycled plastic without affecting its look or property. Therefore, the increasing adoption of recycled plastics is anticipated to positively influence the 2-shot injection molding market. High costs of tools and equipment that are needed for 2-shot injection molding process is the chief restraint for the market’s growth. In addition, limited choice of materials that are suitable for 2-shot injection molding process is also hindering the market’s growth. 2-shot injection molding processes require a long time, which is also negatively impacting the market’s growth.